Click on the thumbnails below to enlarge them. 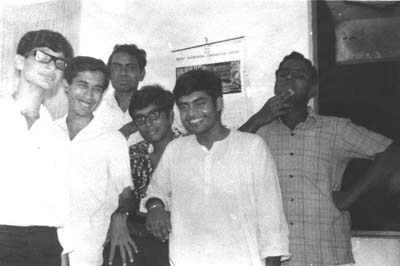 See footnote *** BC Mal, Chanchal Mukherjee,Madhuda, Sharmaji and friends with Asst. 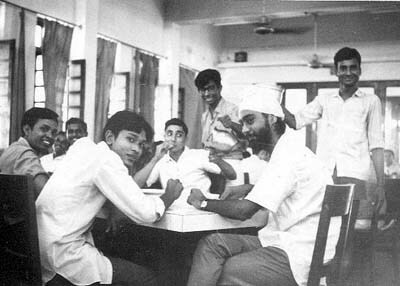 Warden Manu Bhargav, Chawla, Jhunjhunwala, A.K. 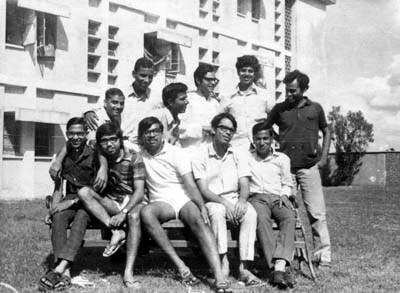 Singh, Gulab C. Mistry, Vasant Khilnani, Mishraji, Arun Lohia, Sagun Chanillo. 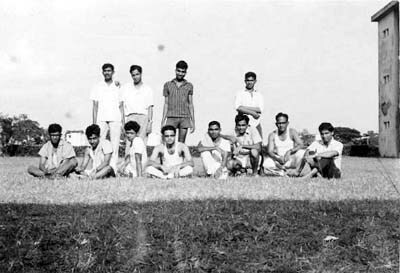 Chawla, Lohia, Manu, Debu, Jiten Jain (VS Hall), GUS, Sagun and friends Vivek Tamhane, Sharmaji, UC Agnihotri, Venkat and friends Manu, Chawla, Jhunjhun, AK Singh, GC Mistry, V Khilnani, Mishraji, Lohia, Sagun. 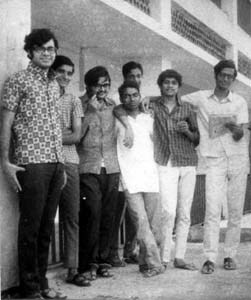 *** Standing (L-R) : Alim Ganjee, P. Bhashyam, Nawal Kishore Sharma, M. Khokani, Amar Shankar Dutta, (name? 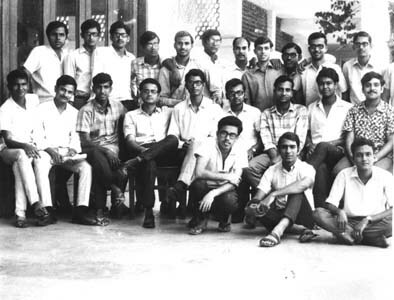 ), (name? 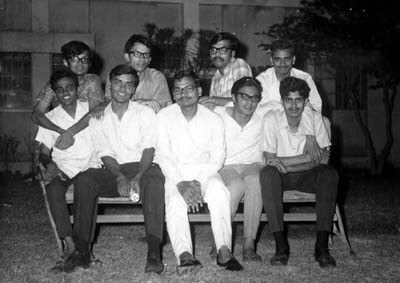 ), Bharat Upadhyay, Pradip Das, Soumen Sengupta, Shushil Kr Nivetia. 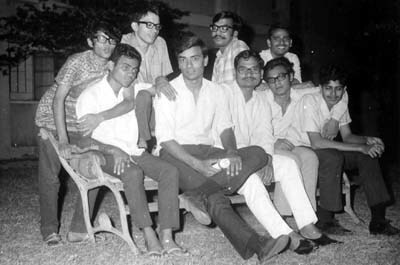 Sitting (L-R) : Bitanshu Haldar, M. P. Dixit, K. Shekhar, Jawahar Khanderia, P. C. Ramesh Babu (Pondy), Shushovan Motayed, B. C. Mal, Barin Das, Sanjeev Zutshi. 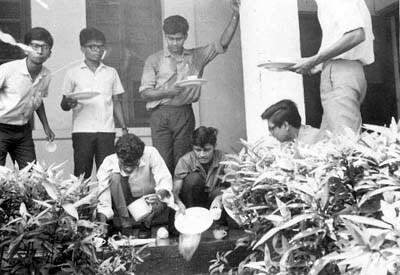 Foreground (L-R): Jayanta Talukdar, Arvind Agrawal, S. N. Natarajan(Azad). 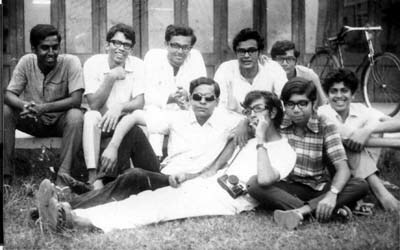 All photos by Debashis Mukherjee. 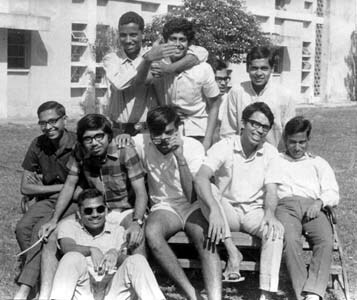 These photographs may be copied / distributed freely.